I love sugar cookies but I really dislike rolling them out. I’m too much of a perfectionist and I get very frustrated rolling out each cookie to be the same exact thickness. I have this same complaint about gingerbread cookies too. My solution is simply avoid cookies that involve this step. 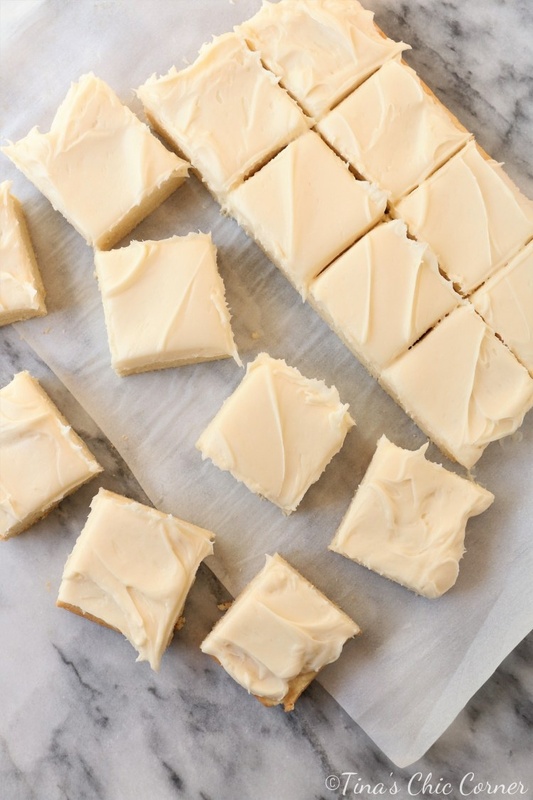 These sugar cookie bars are a perfectionist’s dream because there is essentially no perfection required. I don’t have to fuss at all while making them. In fact, not only are they easy (and stress free) to make, but you can whip them up quickly with minimal dishes to wash. 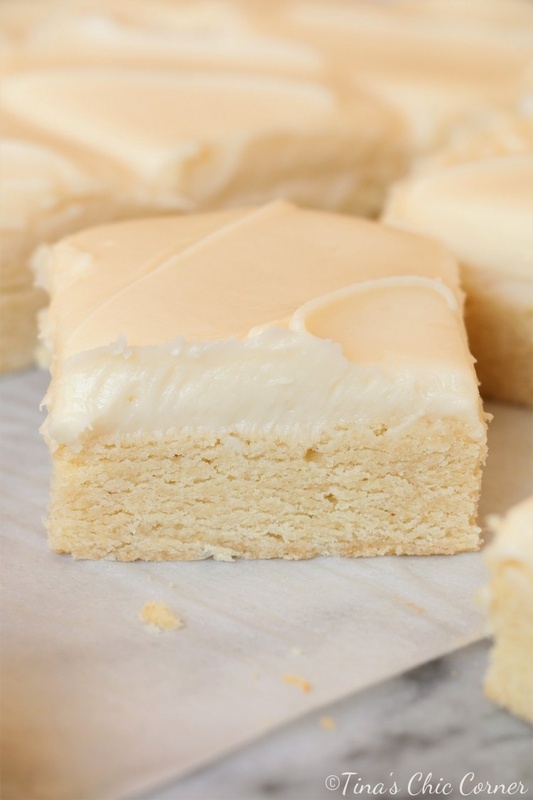 The cookie bar texture is similar to a soft sugar cookie. It’s got a crispy outside layer but it’s soft and tender on the inside, and ever so slightly crumbly. Honestly, it’s the best sugar cookie I think I’ve ever made. Funny how when it comes in a convenient form of a bar instead of a cookie shape I stop having problems with it and it actually somehow tastes better because of it. 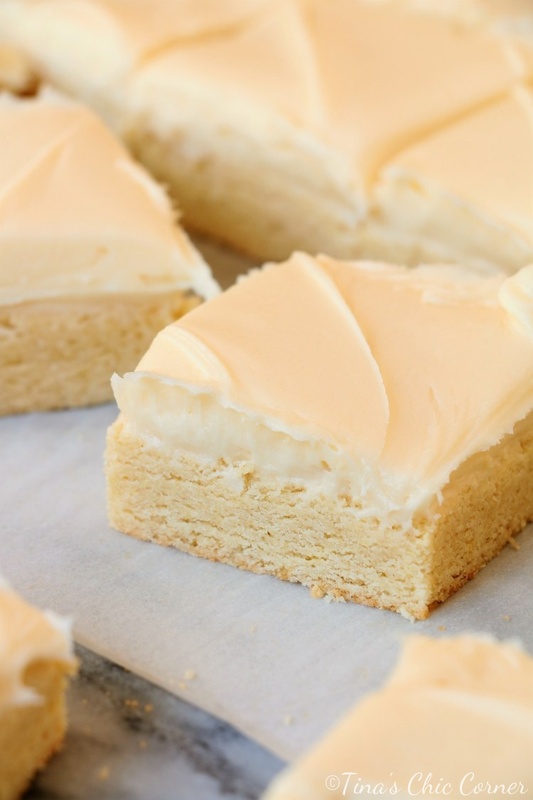 If you don’t like cream cheese frosting, what is wrong with you? Just kidding. I love the stuff, but I would omit it the next time I make these bars. I think it overpowers the bars just a tad. 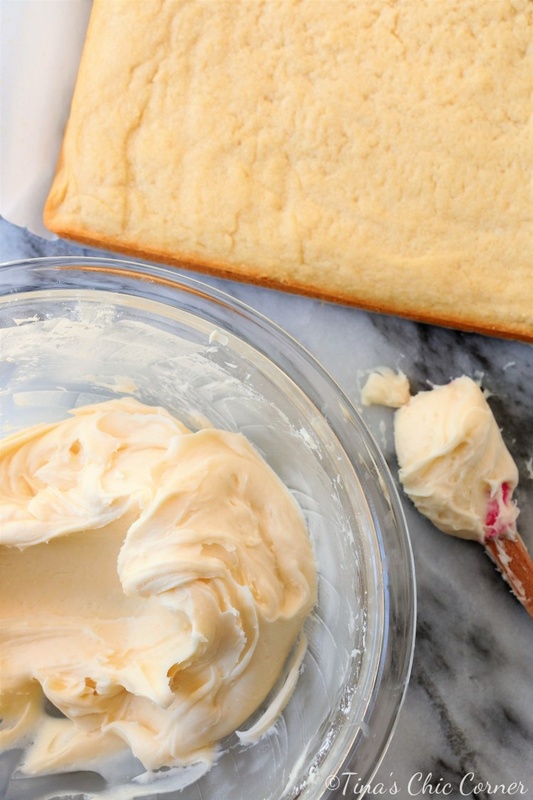 This vanilla homemade frosting recipe is what I would use. I adore frosting and for me the more the better. As you might be able to tell from the pictures, these bars have a lot of frosting on them. If you like less, then by all means use less. Feel free to use store bought frosting. I certainly won’t judge you. There are some fantastic ones out there and if you’re short on time or the desire to make your own then this is a time saver. This route also instantly adds a ton of flavor options. You can buy chocolate or strawberry or birthday cake or whatever you like. The cookies make a great base for anything you want. Okay, this note is not directly related to the frosting, but it sort of is. Just like with sugar cookies, feel free to top them with sprinkles, or write on them, or add some other fun candy treats. You can even color the frosting or the cookies to coordinate them with a holiday. Just like that you’ve got a Christmas or Halloween dessert. If you don’t want to color things, you can still color coordinate your candy toppings for a holiday just as easily. This is a great time to get the kiddos involved. I opted to leave mine without anything on top because… well, because my husband prefers things without sprinkles (or frosting for that matter) and I didn’t think it would be nice to add even more sugar on top of a lot of sugar. Preheat the oven to 350 degrees F. Grease an 8 x 8 pan and set it aside. I like to lay parchment paper or tin foil into the baking pan so that it’s easy to take out for pictures but it’s not required it you just want to cut them out of the pan as you go. In a big bowl, cream the butter and sugar. Add the egg and vanilla extract and mix together. Add the flour, baking powder, and salt and mix again. Pour the batter into the pan and spread it out evenly. I mushed mine in with the back of a measuring cup. Bake it in the preheated oven for about 20 minutes or until a tester inserted comes out clean. 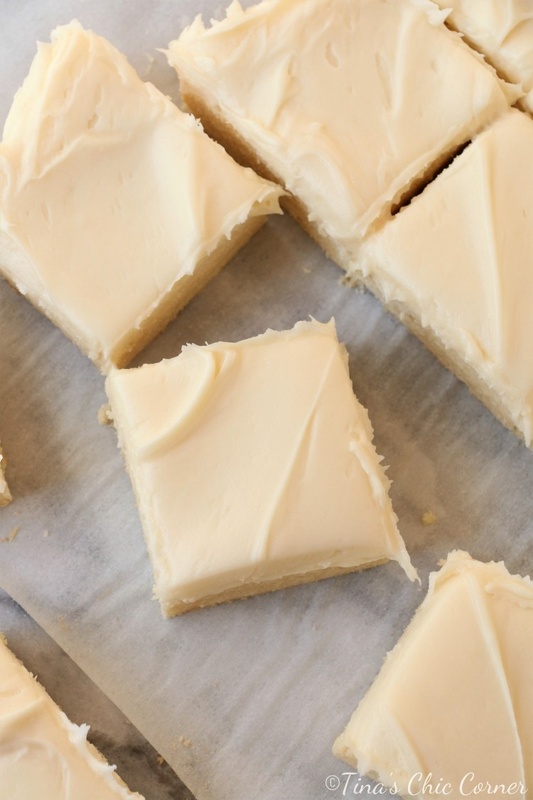 Once the bars have completely cooled, spread the frosting on top. In a medium bowl, mix the butter and cream cheese together. Add the vanilla extract and mix together. Add the powdered sugar, a 1/2 cup at a time (to prevent causing a cloud of powdered sugar from going everywhere), and mix until it’s smooth. Great catch! I updated the recipe to include the size of the pan which is 8×8 inches.